The apple fell to earth as the couple ran from the garden, landing with a small bounce allowing a lone seed to loosen from its fleshy white home and touch the fertile soil. 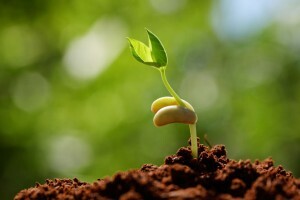 Now free, the seed burrowed deep into the earth, past topsoil and roots which might compete for life giving nutrients, toward the safety of rock and clay. Here, in the moist and cold darkness of life’s foundation, the seed waited for the renewal of light into its world. Many years later the seed could sense there were only a few humans walking above, but there were a great many animals, massive creatures living in a humid and wet environment. The seed was not ready yet for the world above, and so dug even deeper. It’s time to return was far into the future, so the patient seed slept and waited. Soon the earth grew very cold, and the seed drew soil and rock near it to survive. Great masses of ice slowly moved above its home taking rock and soil with it, but the seed was protected and it did not yield its place. For hundreds of years, after surviving the heat and wet, the seed would also survive the unrelenting cold. This was a strong seed, whose determination and purpose was unknown in history, because this seed is history. Warmth returned, and with the sun came people, many people, whose busy lives lead to unspeakable acts of careless, self-indulgent and decadent behavior. The seed was saddened by the actions above, and was longing for change. Then the water came and covered everything the seed could sense. The water stayed on earth until there was no longer any darkness left mankind. The seed was sad that this event had to happen, but relieved in a promise that those events would never occur again. People came back, filling the land and sea with activity. There was some darkness, and it was deep, empty and cruel, but the seed could feel the light searching above, and knew more light would soon appear. When confronted, darkness cannot stand against the light, yet even knowing this; the battle is fought between the opposing forces with unequaled ferocity. The seed began a very slow movement upward, strengthening as it moved, knowing decades will pass during its journey. Knowing the people needed this time to prepare; there was silence from the voice above. The time for the seed was near and there was a great uproar and celebration in the heavens. The people did not know what was happening, although a few select were honored with the truth, so they farmed, and herded; living normal lives in unknown anticipation. The seed was almost home, its eternal destiny as a seed nearly complete, and its future ready to be embraced. The gates of heaven and hell were directly above the seed now, and a war of the ages was headed for its climax on the hill where the seed had fallen, and waited since the birth of this era. Through filtered soil the seed could feel the sun, its warmth caressing the stained ground where so many saints had fallen. A shadow of the cross marched across the line between the seed and its Maker, and this was the signal which foretold the seed’s purpose: to sprout forth a flower of blinding light, unquenchable truth, and mountainous compassion. The flower would be in full bloom when the Son had gone home, and then would become the voice of the Maker, and His Son, for all of us to hear. From the moment we left the garden until the resurrection, God’s plan for His return was in full motion. Never was a moment wasted on reflection or indecision. God planted a seed in the garden that sprouted exactly as planned. The sole purpose of a seed is to grow into something much larger, and with added complexity. The seed is the beginning of something more; it is a promise of greater things to come. When God plants a seed into us it can be destined to grow into the love for your wife or children, or to change jobs, join the ministry or live a healthier lifestyle. God’s seed will make us grow – for the better. No matter the purpose of the seed, know this; it will never die, give up or abandon you. A seed planted by God will always prevail against any enemy, and it will sprout and grow exactly when it is needed the most. This entry was posted in God has a Plan, Living a Christian Life, Talking to God and tagged compassion, friend, God, great, Jesus, life, love, perspective, plan, seed, Wisdom by Michael Obermire. Bookmark the permalink.